A public meeting against deployment of Japan Ground Self-Defense Force (JGSDF) to Ishigaki Island was held in Ishigaki City gymnastic hall on January 29, and approximately 800 people from around the city attended the meeting. The group adopted a resolution to oppose the city mayor Yoshitaka Nakayama’s announcement to accept the JGSDF. They concluded the protest while holding picket signs with the words “missile” and “base” crossed out. Mayor Nakayama had said he would “to listen to opinions” from the four districts around the planned area before making any decisions on the deployment, yet the announcement of his approval was suddenly made public on December 26. 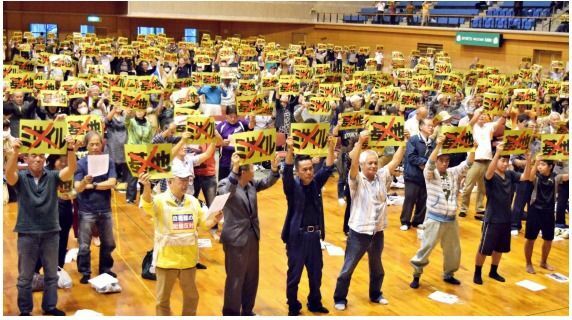 Opposing the announcement, the “residents’ liaison association to oppose militarization of Ishigaki” including the four districts held the public meeting. Ten residents from the four districts, war survivors and high school students spoke on stage. Seventy-nine-year old war survivor, Shigejiro Uehara who lives in Kawahara stressed the lessons from own experience. A senior student from Yaeyama Norin High School, Kokoro Nohara also shared her wishes.